The films of Pixar ("Monsters, Inc" and the "Toy Story" series) as well as PDI ("Antz"), have amazed us over the past few years with the advancement of computer-generated animation instead of the traditional, hand-drawn style. "Ice Age", a bit of a mixture of previous animated plots (there's definitely a noticable amount of "Shrek" to the proceedings), does not stun with the detail of the animation, but the scope. The icy wilds have been realized with remarkable style and even little things - droplets of water in the midst of a larger splash landing realistically - are impressively rendered. The film opens with a massive herd of animals heading South for the Winter, attempting to outrun the oncoming snow and cold. Yet, a small group of animals are actually heading the other way; Manfred (Ray Romano), a grumpy wooly mammoth, Sid (John Leguizamo) a sloth, and Diego (Denis Leary), a tiger, have all become involved in trying to take a human baby that has been separated back to its family. Diego, on the other hand, may have other plans for his three traveling companions, as other tigers seem to lurk around every pass, awaiting the group. "Ice Age" does start off a little on the flat side, as the introduction stage of the film needed to pick up the pace a little bit. Once the final team goes on the road in search of the humans, things start to pick up a little bit. There's a few inspired sequences, such as a terrifically funny one involving dodo birds and their attempts to secure their stash of food and other where an ice cave turns into something of a theme park ride. You've probably seen part of the best bits of the film in the trailer, a short, self-contained piece that shows a little creature named Scrat (a squirrel/rat) attempting to hide his beloved acorn and nearly being crushed by a glacier as a result. The film is not about Scrat, but his attempt to find a secure place for that acorn is a bit of a subplot that occasionally runs back into the main story and, most amusingly, ends off the picture. The voice acting is quite good throughout the movie. Leguizamo's fast-talking sloth really could have gotten tremendously annoying, but surprisingly, I found his bits entertaining. Romano's dry gloom provides a good counterpoint as well, even if their teaming echoed the Shrek/Donkey pairing from "Shrek" a little too closely. Leary believably breaks down his character's gruff surface over the course of the film, as well. The film may not be as consistently inspired as "Shrek" or the "Toy Story" series, but "Ice Age" deserves to stand up with many of the other recent animated efforts. The film certainly has enough humor for both adults (a sight gag about evolution got a big laugh from the audience I saw it with) and children. I'm hoping there will be further adventures with these characters and a larger adventure for Scrat. VIDEO: The film is presented in 1080P (AVC) by 20th Century Fox Home Entertainment. While this is not a flawless presentation, it is often nothing short of stunning. A direct-from-digital transfer, the level of sharpness and detail are often thrilling to the eye. Of particular note is - of course - the fur of the creatures, which looks far more crisp here than ever before. Little details that one would never have noticed before at home, such as the detail in a leather pouch, are seen clear as day here in this image that often has a 3-D feel. If there is a concern, it is a minor one. Some of the darker scenes do look slightly noisy. Otherwise, the picture remained crystal clear and free of the usual issues. While most of the film offered a rather subdued color palette (not surprisingly, given the wintery aspect), the colors that are seen are simply dazzling, with outstanding saturation and no smearing or other faults. One scene early on where the characters walk through what appear to be some cherry blossom trees (at least that's what I'm guessing they are) is a jaw-dropper, as the pinks of the blossoms are just gorgeous. Aside from a slight concern or two, this presentation was certainly eye candy. SOUND: The film is offered with a DTS-HD Lossless Master Audio 5.1 surround track. The soundtrack proves to be absolutely terrific. In the animation realm, this sound mix only falls a bit short of the kind of outstanding work that Gary Rydstrom has done with the Pixar films. Surround use is near-constant, and the rear speakers often do a wonderful job of opening out the action into the room. Although there are plenty of fantastic surround-sound moments, the opening - as Scrat tries to not get run down by an oncoming glacier - is certainly one of the best. The Dodo bird sequence is certainly a fun example of great sound design, too. Audio quality is stellar, as well; dialogue remained crisp and clear, while sound effects were also quite pleasantly distinct. While maybe not up there with some of the best sound presentations on DVD, I found several scenes to make for good demo material. Overall, both the video and audio quality on this title are just delightful. EXTRAS: Commentary: The Blu-Ray offers a commentary (the extras are carried over from the DVD) from co-director Carlos Saldanha and director Chris Wedge. Although these two aren't quite as funny as the Pixar commentary tracks usually are, they are at least enthusiastic and witty, with some pretty funny jokes about the making of the picture and a few interesting stories to tell about points along the way through the production. Still, there are some rather slow patches and a bit too much about how great everyone was. Worth a listen. Deleted Scenes: 6 deleted scenes - "Paying Toll With Aardvarks", "Sid and Sylvia Intro", "Sabre Stake Out", "No More Fruit For You", "Sid and the Ladies" and "Sid and Sylvia" are offered here, all with optional commentary from the directors. Some funny moments here, but I didn't think any of the scenes should have been in the final picture. Scrat's Missing Adventure: Fans of the character will be thrilled to find another short starring the character that's as funny - if not funnier - than Scrat's scenes in the film itself. We also get a series of trailers for other Fox titles, as well as "Ice Age" trailers. 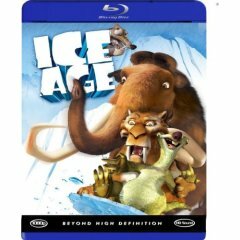 Final Thoughts: I've found "Ice Age" funnier the more I watch it - it's an engaging, sweet adventure with some solid laughs. Fox's Blu-Ray edition offers near-perfect image quality, stellar audio and a few good extras. Highly recommended.